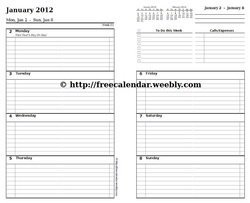 These printable calendars, weekly agendas and productivity templates are ready to be downloaded and printed for free. I am very particular in my calendaring needs, and since I could not find exactly what I was looking for, I created my own designs -and here they are! I will be adding more templates, so if you like what you see bookmark this page for later use. Weekly Calendar 2012, click to enlarge screenshot. Download below. 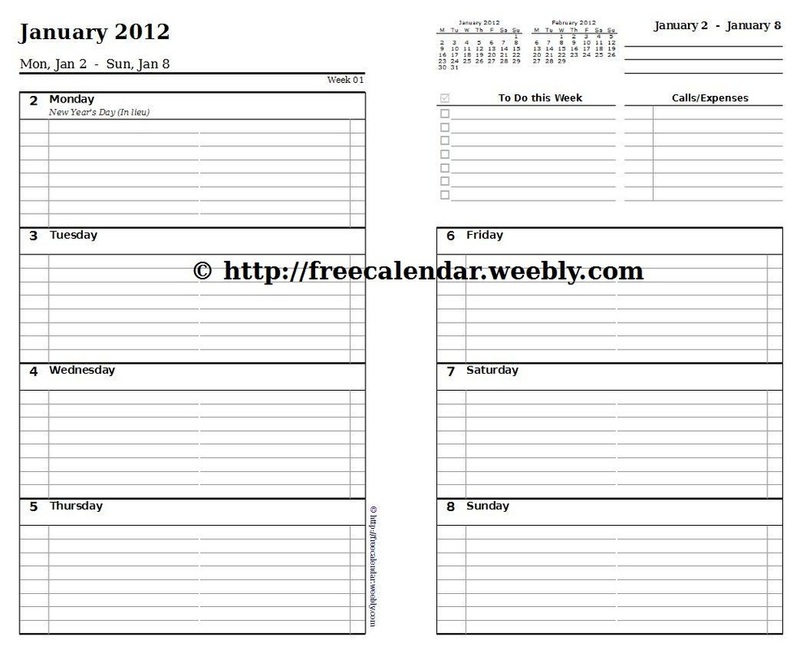 This is a dated printable calendar 2012 with a weekly view and includes both Canadian and US Holidays. It also has a weekly to do list and weekly expenses (you can of course use the space to track other items). The printable calendar PDF is free to download. Can be used as calendar refills if you already own an oganizer. Classic Size: 5.5" x 8.5" half letter-size (108 mm x 172 mm). Two pages per week format. Print on regular Letter size (8.5 x11). Download this version if you want pad or organizer re-fill sheets. Simply cut the whole stack down the middle after printing on letter sized paper. Punch 3 or 7 holes in the middle, depending on the style of your binder or oganizer. If you find this free calendar refill useful (and want to encourage me to create the 2013 version), please consider donating. I would trully appreciate it. Download this version if you plan to simply 3-hole punch the sheets at the top and place in a letter size binder. Has one less line per day and more space at the top for hole punching. Where does the time go? This 8 1/2" x 5 1/2" daily time log sheet is designed to track, as well as plan, your daily activities. This one is for those visual and "like to tick stuff off" folks. It allows you to visualize the time you have available and reduce distractions by focusing on what is important.